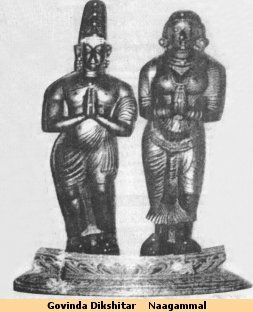 Govinda Dikshitar who was the Minister of Raja Acchudappa Nayakkar of Tanjavur, served as the Minister to three Nayaka rulers from 1515 - 1636. Acchudappa Nayakkar is said to have given gold equal to his weight (Tulaabaaram), which Govinda Dikshitar used to renovate the Mahaamahm tank, the 16 mandapams and the tank steps. He constructed the vimanams for the mandapams. He was in charge of renovating the Aadi Kumbheswarar koil with a new Raja Gopuram and the kudamuzhukku took place during the reign of Sevappa Nayakkar. He had done various charities following the rules laid in the sastras. As a tribute streets in Thiruvidaimarudur, Thiruvenkaadu, etc. were named mahadhaana streets (great charities). He had erected pushpa mandapams with a pair of vimanams in Thanjavur, Vennarangarai, Thiruvalanchuzhi, Kumbakonam, Thiruvidaimarudur. The silver rishaba vahanam & the silver chariot in Thiruvidaimarudur were his contributions. He had also formed the Raja Kaavya Veda Paadasalai in 1542 to teach sishyas the three vedams Rig, Yajur & Sama in the gurukula system. There is an idol of Govinda Dikshitar & his wife Nagammal in the Aadhi Kumbeshwara temple. Dikshitar was popularly knwon by the Ayyan in those days. Ayyan street, Ayyan kulam etc known to this by his name are a tribute to the great soul.